Homepage » CAMEROON: Plastic waste used to support organic urban agriculture. 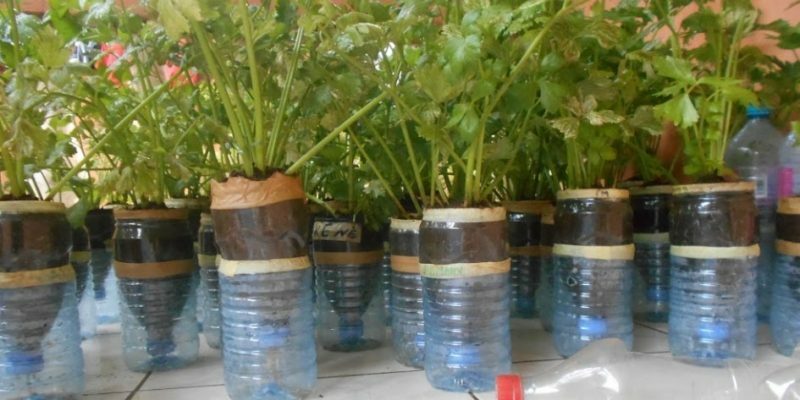 CAMEROON: Plastic waste used to support organic urban agriculture. On the sidelines of the conference organised at its headquarters in Yaoundé on the 5th of June 2018, the NGO Youth and Sustainable Development for Africa presented its vast urban agriculture project to the public. A method of agriculture that also makes it possible to recycle plastic waste in a useful way. Funny setting at the headquarters of the NGO Youth and Sustainable Development for Africa (J2D Africa)… Urban agriculture has made its nest there. Bottles and old plastic bags found a second life there. They support several plants. Celery, waterleaf (this plant is used in the composition of eru, a vegetable dish generally accompanied by water fufu and native to the North-West region of Cameroon, editor’s note) and several other varieties are grown organically. A staging that aroused the curiosity of the fifty or so people who came to take part in the conference organised by J2D Africa at its headquarters on Tuesday, June 5, 2018, on the occasion of the celebration of World Environment Day. “In a bag, we can grow up to 24 feet of vegetables. And each bag has a life span of at least two years. When they are big enough, they can be harvested for cooking and cuttings will be born from other vegetable stalks”; explains Jean François Nkonzou Takuété, head of the NGO to his guests. According to him, this method is ecological for several reasons. It allows us not to leave plastic bottles and bags, as well as car wheels in the nature. Urban agriculture is also healthy, because it is practised organically and guarantees de facto food security,” says François Nkonzou Takuété. In reality, instead of using chemical fertilisers, the J2D Africa team uses animal droppings to enrich the soil in which plants grow. Knowing that, in the city of Yaoundé, vegetables are mostly grown in swamps. These are often used by households to empty septic tanks. The danger is twofold: first, the water used to water the vegetables is contaminated. And, before bringing them to market, unfortunately, the same water is often used for cleaning, especially in the case of lettuce. Urban agriculture is therefore an effective way of recycling plastic waste, but not the only one. During the conference, the participants gathered ideas that will allow them to stop the dumping of plastic objects in nature. The purpose of the meeting was also to make them understand that waste can lift them out of poverty, since collecting bottles used at home to sell generates income. An income that would be more important for those able to transform them, for example into purses, bags and other objects made from plastic waste. And it is not the raw material that is scarce, because Cameroon produces 600 000 tons of plastic waste each year, according to recent statistics from the Ministry of Environment, Nature Protection and Sustainable Development. The entrance ticket to this conference for each participant was a new kind: one had to bring at least 5 plastic bottles. A strategy which made it possible to collect 456 bottles in one afternoon. As a result, it is possible to win victories in this daily fight against plastic waste.